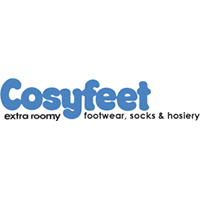 Cosyfeet offers a range of comfortable footwear options, in addition to a number of similar products. You can use this website to shop for shoes for men, shoes for women, and a great deal more than that. The main products at Cosyfeet are designed to provide extra room, and there are a number of possibilities within that thought. You can find extra roomy shoes, extra roomy boots, extra roomy sandals, extra roomy slippers, and extra roomy stretchy shoes. You can also find a variety of foot comfort products, including nail care, bunion relief, and toe solutions. A large inventory of hosiery and socks are also available for purchase at this site. For most up to date offers check out Cosyfeet on Facebook and Twitter or contact Cosyfeet Support for any questions.